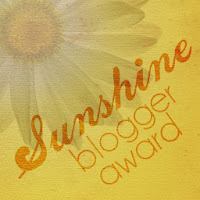 Kate from Raising the Rogers nominated me for the Sunshine Award. Kate is such a sweet blog friend. Go check out her fun blog and her adorable kids! 1. What are you doing today? It was cold and snowy today, so I stayed home with Lily and Liam. I stayed in my pajamas, cleaned, and ran 3 miles. Dylan and Lexie are home from school, and we're anxiously waiting for Grant to make it home. We're having tacos for dinner, then putting the kids to bed. After that, we'll probably watch something on Netflix. 2. What is your favorite holiday and why? I love Christmas! It really is the most joyful time of year! 3. Where is your dream destination? What would you do there? I would love to go to Hawaii or another tropical island. Laying on the beach all week sounds perfect! 4. What is your go-to dinner meal? Probably Rigatoni. I make a simple version. Boil rigatoni and brown ground meat. Place both in a casserole dish and cover with Prego Traditional Pasta Sauce and Mozzarella Cheese. Bake at 350 for about 15-20 minutes. Everybody loves it and it feeds a lot of people! I serve it was garlic bread, green beans, and salad. 5. Name your favorite fall fashion trend. Boots, legwarmers, and skinny jeans! 6. If you could live anywhere where would it be and why? Florida, near a beach. I love the heat and the beach. The end. 7.If you could only shop at one store for clothes for the next 5 year what store would you choose? TJ Maxx! I love that store for everything!!! 8. What is your all time favorite Christmas gift you have ever received? My horse! He was a gift from my parents when I was 12, and I still have him! 9. Halloween just passed....what candy did you sneak from your kids baskets? (Or what will you steal in the future?) Any kind of chocolate bar! I love chocolate! I attempt to fight them for Sour Patch Kids, too! 10. What song comes on the radio that you immediately turn up? None in particular. I just station surf until I find a song I like! 1. What is the next thing you're going to buy? 2. Do you have any goals/resolutions for 2014? 3. How many children do you want? 4. What is your favorite food to eat at Thanksgiving dinner? 5. What are your holiday plans? 7. What are you currently watching on TV? 8. Which do you prefer: showers or baths? 10. What is something that you need to buy yourself, but keep putting off? I hope everybody has a wonderful Thanksgiving! Loved this!! Thanks so much for sharing!! Definitely move to Florida---I would love that! Haha...today was warm and windy! I miss the snow sometimes though!! =) Chocolate and Sour Patch Kids are my fav too!!! yum!! I am right there with you on moving to FL! Great list! I'm with you on Florida and TJ Maxx! :) I'll answer your questions later... how fun! !